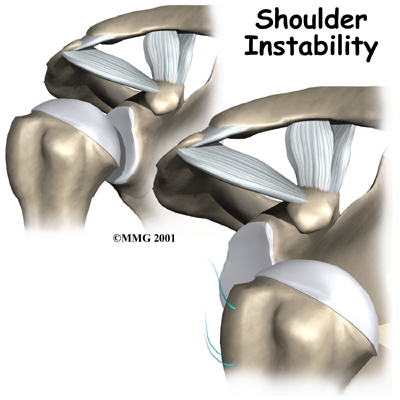 Welcome to Purposed Physical Therapy's patient resource about Shoulder Instability. Shoulder instability means that the shoulder joint is too loose and is able to slide around too much in the socket. In some cases, the unstable shoulder actually slips out of the socket. If the shoulder slips completely out of the socket, it has become dislocated. If not treated, instability can lead to arthritis of the shoulder joint. The shoulder is made up of three bones: the scapula (shoulder blade), the humerus (upper arm bone,) and the clavicle (collarbone). The rotator cuffconnects the humerus to the scapula. 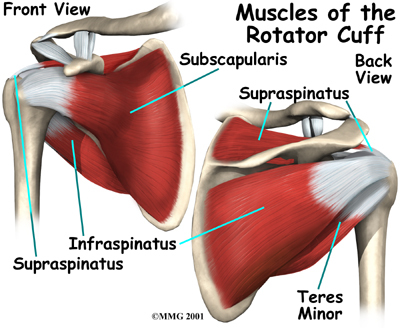 The rotator cuff is actually made up of the tendons of four muscles: the supraspinatus, infraspinatus, teres minor, and subscapularis. Tendons attach muscles to bones. Muscles move bones by pulling on tendons. The muscles of the rotator cuff also keep the humerus tightly in the socket. A part of the scapula, called the glenoid, makes up the socket of the shoulder. The glenoid is very shallow and flat. A rim of soft tissue, called the labrum, surrounds the edge of the glenoid, making the socket more like a cup. The labrum turns the flat surface of the glenoid into a deeper socket that molds to fit the head of the humerus. 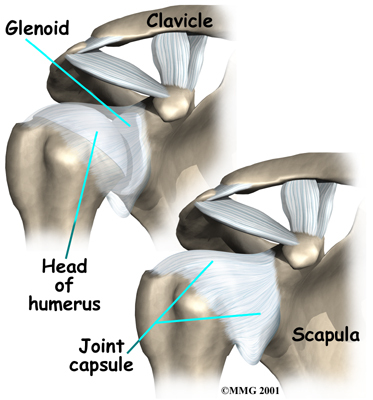 Surrounding the shoulder joint is a watertight sac called the joint capsule. The joint capsule holds fluids that lubricate the joint. The walls of the joint capsule are made up of ligaments. Ligaments are soft connective tissues that attach bones to bones. The joint capsule has a considerable amount of slack, loose tissue, so that the shoulder is unrestricted as it moves through its large range of motion. If the shoulder moves too far, the ligaments become tight and stop any further motion, sort of like a dog coming to the end of its leash. Dislocations happen when a force overcomes the strength of the rotator cuff muscles and the ligaments of the shoulder. 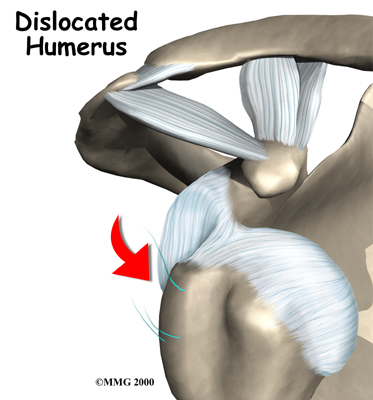 Nearly all dislocations are anterior dislocations, meaning that the humerus slips out of the front of the glenoid. Only three percent of dislocations are posterior dislocations, or out the back. Sometimes the shoulder does not come completely out of the socket. It slips only partially out and then returns to its normal position. This is called subluxation. What makes a shoulder become unstable? Shoulder instability often follows an injury that caused the shoulder to dislocate. 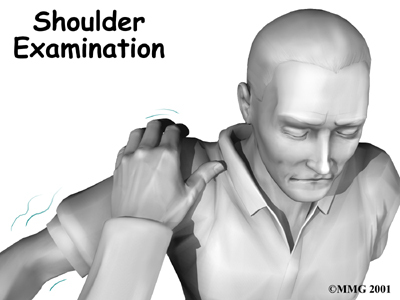 This initial injury is usually fairly significant, and the shoulder must be reduced. To reduce a shoulder means it must be manually put back into the socket. The shoulder may seem to return to normal, but the joint often remains unstable. The ligaments that hold the shoulder in the socket, along with the labrum (the cartilage rim around the glenoid), may have become stretched or torn. This makes them too loose to keep the shoulder in the socket when it moves in certain positions. An unstable shoulder can result in repeated episodes of dislocation, even during normal activities. Instability can also follow less severe shoulder injuries. In some cases, shoulder instability can happen without a previous dislocation. People who do repeated shoulder motions may gradually stretch out the joint capsule. This is especially common in athletes such as baseball pitchers, volleyball players, and swimmers. 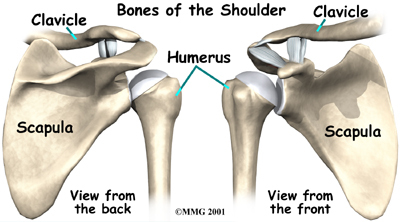 If the joint capsule gets stretched out and the shoulder muscles become weak, the ball of the humerus begins to slip around too much within the shoulder. Eventually this can cause irritation and pain in the shoulder. A genetic problem with the connective tissues of the body can lead to ligaments that are too elastic. When ligaments stretch too easily, they may not be able to hold the joints in place. All the joints of the body may be too loose. Some joints, such as the shoulder, may be easily dislocated. People with this condition are sometimes referred to as double-jointed. What problems does an unstable shoulder cause? Chronic instability causes several symptoms. Frequent subluxation is one. In subluxation, the shoulder may slip (sublux) in certain positions, and the shoulder may actually feel loose. This commonly happens when the hand is raised above the head, for example while throwing. Subluxation of the shoulder usually causes a quick feeling of pain, like something is slipping or pinching in the shoulder. Over time, you may stop using the shoulder in ways that cause subluxation. The shoulder may become so loose that it starts to dislocate frequently. This can be a real problem, especially if you can't get it back in the socket and must go to the emergency room every time. 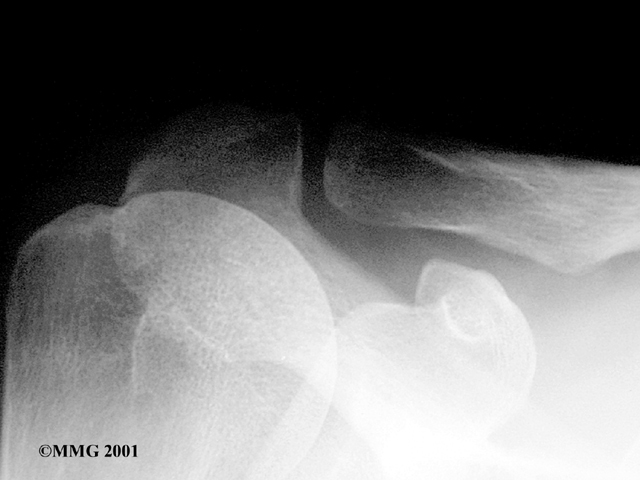 A shoulder dislocation is usually very obvious. The injury is very painful, and the shoulder looks abnormal. Any attempted shoulder movements cause extreme pain. A dislocated shoulder can damage the nerves around the shoulder joint. If the nerves have been stretched, a numb spot may develop on the outside of the arm, just below the top point of the shoulder. 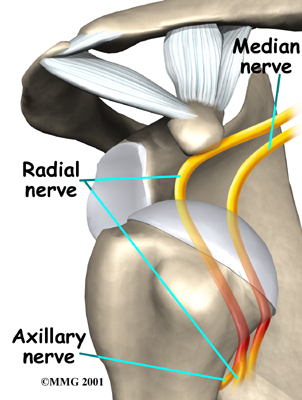 Several of the shoulder muscles may become slightly weak until the nerve recovers. But the weakness is usually temporary. When you visit Purposed Physical Therapy, our Physical Therapist will diagnose your shoulder instability primarily through your medical history and physical exam. The medical history will include many questions about past shoulder injuries, your pain, and the ways your symptoms are affecting your activities. In the physical exam, our Physical Therapist will feel and move your shoulder, checking it for strength and mobility. We will stress the shoulder to test the ligaments. When the shoulder is stretched in certain directions, you may get the feeling that the shoulder is going to dislocate. Even nonsurgical treatment for shoulder instability usually requires a rehabilitation program. The goal of Physical Therapy is to strengthen the rotator cuff and shoulder blade muscles to make the shoulder more stable. When you begin your physical rehabilitation program at Purposed Physical Therapy, we will first help you control your pain and inflammation. The initial treatment that we recommend to control pain is usually rest and anti-inflammatory medication, such as aspirin or ibuprofen. Ensure that you consult with your doctor or pharmacist regarding the use of pain relief or anti-inflammatory medication. Our Physical Therapist will show you ways to avoid positions and activities that put your shoulder at further risk of injury or dislocation. We may issue overhand athletes a special shoulder strap or sleeve to stop the shoulder from moving in ways that strain it. Your Physical Therapist may employ heat or ice treatments to ease pain and inflammation. We use hands-on treatments and various types of exercises to improve the range of motion in your shoulder and nearby joints and muscles. Later, you will do strengthening exercises to improve the strength and control of the rotator cuff and shoulder blade muscles. Our Physical Therapist will help you retrain these muscles to keep the ball of the humerus in the socket. This will improve the stability of the shoulder and help your shoulder joint move smoothly. Although the time required for recovery varies, as a guideline, you may need Physical Therapy treatments for six to eight weeks. Most patients are able to get back to their activities with full use of their arm within this amount of time. Rehabilitation after surgery is more complex. You will likely wear a sling to support and protect the shoulder for one to four weeks. The Physical Therapists at Purposed Physical Therapy can design a personalized program for your recovery. Depending on the surgical procedure, you will probably need to attend therapy sessions for two to four months. You should expect full recovery to take up to six months. Our first few Physical Therapy treatments will focus on controlling the pain and swelling from surgery. Ice and electrical stimulation treatments may help. Our Physical Therapist may also use massage and other types of hands-on treatments to ease muscle spasm and pain. Therapy after Bankart surgery proceeds slowly. We will begin range-of-motion exercises soon after surgery, but are cautious about doing stretches on the front part of the capsule for the first six to eight weeks. Our program gradually works into active stretching and strengthening. Physical Therapy goes even slower after surgeries where the front shoulder muscles have been cut. Exercises begin with passive movements. During passive exercises, our Physical Therapist will move your shoulder joint, but your muscles stay relaxed. We gently move your joint and gradually stretch your arm. Our Physical Therapist may teach you how to do these passive exercises at home. Active therapy starts three to four weeks after surgery. We will teach you to you use your own muscle power in active range-of-motion exercises. Our Physical Therapist may begin with light isometric strengthening exercises. These exercises work the muscles without straining the healing tissues. At about six weeks, we will have you start doing more active strengthening. These exercises focus on improving the strength and control of the rotator cuff muscles and the muscles around the shoulder blade. Our Physical Therapist will help you retrain these muscles to keep the ball of the humerus in the socket. This helps your shoulder move smoothly during all your activities. By about the tenth week, we will start have you begin more active strengthening. These exercises focus on improving strength and control of the rotator cuff muscles. Strong rotator cuff muscles help hold the ball of the humerus tightly in the glenoid to improve shoulder stability. Overhand athletes (such as those who throw baseballs or footballs, swim or play volleyball or racquet sports) start gradually in their sport activity about three months after surgery. Although the time required for recovery varies, overhand athletes can usually return to competition within four to six months. Some of the exercises we’ll teach you are designed to get your shoulder working in ways that are similar to your work tasks and sport activities. Our Physical Therapist will help you find ways to do your tasks that don't put too much stress on your shoulder. Before your therapy sessions end, we will teach you a number of ways to avoid future problems. Your doctor may order an X-ray. X-rays can help confirm that your shoulder was dislocated or injured in the past. If your doctor is unsure about the diagnosis, you may need to undergo further tests. A surgeon may need to examine your shoulder using an arthroscope while you are under general anesthesia, which puts you to sleep. An arthroscope is a tiny TV camera inserted into the shoulder through a small incision. This allows a good look at the muscles and ligaments of the shoulder. When you are awake, it is hard to test the ligaments because you automatically tighten the muscles during the exam. When you go to the doctor with a dislocated shoulder, X-rays are necessary to rule out a fracture. X-rays are usually done after the shoulder is put back into joint. This allows your doctor to make sure the joint is back in place. Your doctor may suggest a cortisone injection if you have trouble getting your pain under control. Cortisone is a strong anti-inflammatory medication. If your Physical Therapy program doesn't stabilize your shoulder after a period of time, you may need surgery. There are many different types of shoulder operations that have been developed and used in the past to stabilize the shoulder. Almost all of these operations attempt to tighten the ligaments that are loose. The loose ligaments are usually along the front or bottom part of the shoulder capsule. Surgery on the shoulder has improved dramatically over the past two decades. many of the procedures that have been developed in the past have been abandoned altogether. 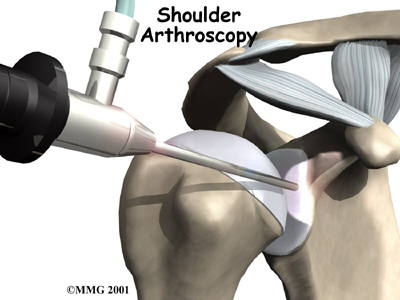 Today, surgery that is performed for stabilizing an unstable shoulder is most commonly done using the arthroscope. The most common method for surgically stabilizing a shoulder that is prone to anterior dislocations is the Bankart repair. 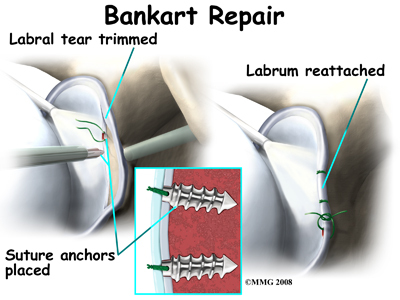 In the past, the Bankart repair was done through a large incision made in the front (anterior) shoulder joint. This required damage to a great deal of normal tissue in order for the surgeon to be able to see the damaged portion of the joint capsule. The procedure was difficult and usually involved an attempt to sew or staple the ligaments on the front side of the joint back into their original position. The arthroscope has changed all that. 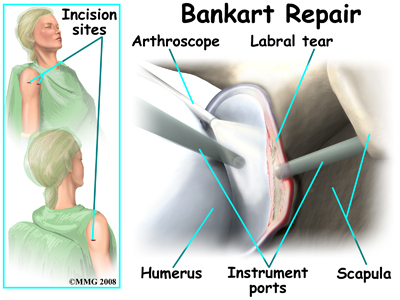 To perform the Bankart type repair using the arthroscope, several small incisions are made to insert the arthroscope and special instruments needed to complete the procedure. These incisions are small, usually about one-quarter inch long. It may be necessary to make three or four incisions around the shoulder to allow the arthroscope to be moved to different locations to see different areas of the shoulder. Once any degenerative tissue and bone spurs are removed, the torn ligaments that stabilize the shoulder are reattached to the bone around the socket of the shoulder, the glenoid. Special devices have been designed to reattach these ligaments. These devices are called suture anchors. 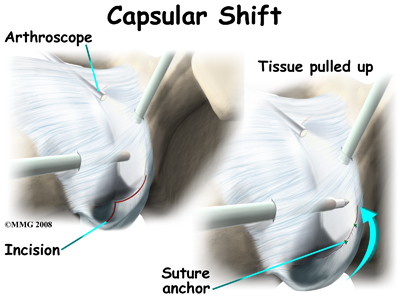 Another surgery to tighten a loose shoulder joint is a procedure called a capsular shift. The lining of any joint is called the joint capsule. The joint capsule forms a pocket, or bag that is made up of the ligaments and connective tissue around the joint. 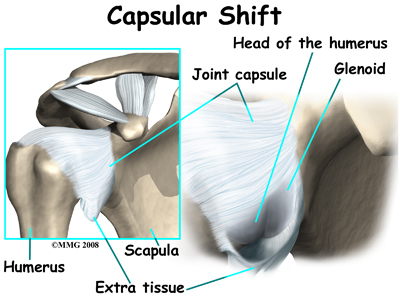 The shoulder joint has a fairly large joint capsule that is necessary to allow the joint to move in such a wide range. Sometimes the problem causing the shoulder instability is because the joint capsule is simply too large. This is sometimes referred to as a redundant, or patulous joint capsule. This may cause shoulder instability in multiple directions. This is sometimes referred to as multi-directional instability. In order to fix this type of instability, the joint capsule needs to be made smaller and tightened. This procedure also can be performed using the arthroscope. The surgeon pulls the flap of tissue over the front of the capsule and connects it together. This is similar to when a tailor tucks loose fabric by overlapping and sewing the two parts together. Once the appropriate degree of tightness is achieved, the surgeon uses a combination of sutures and suture anchors to hold the joint capsule in this position until healing occurs.